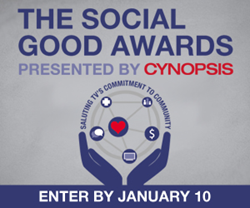 The Cynopsis Social Good Awards is the industry's top honor recognizing pro-social initiatives that have inspired others while effecting positive change. The entry deadline is Wednesday, January 10, 2018. Cynopsis will host an event celebration highlighting the finalists and announcing winners on May 22, 2018 in New York City. "The intersection of the media industry and social conscience is a powerful place. Our industry is filled with connected, compassionate professionals who use their energy and resources to give back," said Cathy Applefeld Olson, Cynopsis editor and event producer. "The Social Good Awards honor these good works across programming, partnerships, PSAs and more." Spanning the spectrum of television, radio, and online platforms, the category list includes over 30 options for innovative linear TV, top digital content and savvy marketing. Winners and honorable mentions will be celebrated during an awards event on May 22, 2018 in NYC. For entry questions, contact Cathy Pearson at cathyp@cynopsis.com. For advertising or sponsorship information, contact VP of Sales & Marketing, Mike Farina at mike@cynopsis.com.